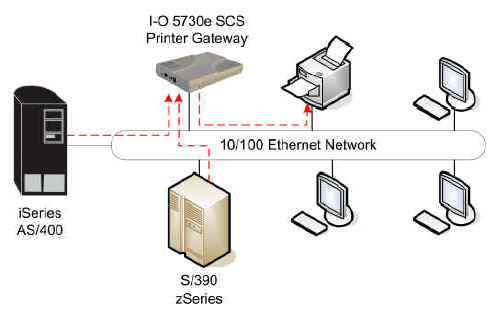 The I-O 5730e SCS Printer Gateway is a high speed Ethernet-in, Ethernet-out SCS gateway print server designed to convert native IBM Power8, Power7, iSeries AS/400 i5 or zSeries S/390 zSeries print jobs to allow them to be printed by any printer on the Ethernet LAN. The 5730e delivers IBM SCS printing via TCP/IP, providing the control and printer feedback found in an IBM host environment. If you need IPDS connectivity for your laser printers and MFPs, click here to see the 5765e IPDS Print Server Gateway. Host controlled printing, including error reporting, page range printing etc. Attached to the LAN, the 5730e supports high-speed, high-performance printers. Without the bottleneck of a slow parallel port, the 5730e supports speeds of up to 300 pages per minute. Whether printing from an IBM i5, iSeries, AS/400 or a zSeries-S/390, fast printing can be obtained with matrix printers or PCL laser printers. 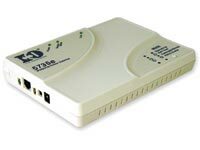 In addition to the Ethernet connection, the 5730e has a parallel port to directly attach a printer if it does not have an Ethernet connection. The 5730e offers the same reliable, full-function IBM host printing and control found with traditional direct attached Twinax/Coax printers. With the 5730e Print Server Gateway your printer is configured as a true "Device" printer and not a "Remote Out Queue Printers". Your IBM host print jobs are not lost in the black hole of "Remote Out Queue" LAN printing. The 5730e provides bi-directional communication between the printer and the IBM host, allowing error reporting and page range printing. Page Range Printing - Permits users to print select page ranges from large documents and reports. Printer Error Reporting - Prevents loss of IBM Host print data by providing same level of print status reporting as a direct system attached Twinax or coax printer. True IBM iSeries AS/400 and S/390 zSeries Printer Emulations - Permits full-function IBM Host printing on the attached LAN printer. 3812-01 (SCS) laser, 4214 matrix and 5224/25/56 matrix printer emulations. No Host Print Transform - No need to waste valuable processor cycles on EBCIDIC to ASCII translation. The 5450e / 5430e handles that all with it's own embedded RISC processor. I-O's Configuration Utility software is included with every 5730e. Whether selecting TCP/IP or SNA, configuration is made easy through the use of a menu-based utility. Plus a wide range of additional features that boost productivity and performance. The 5730e takes advantage of high-speed, high-performance printers without the bottleneck of the parallel port. Standard SCS host print jobs can be seamlessly printed over a LAN. Users are notified when the print job is finished taking the guess work out of printing. Printing can be done on both sides of a page. The full functionality of a duplex printer can be utilized. Provides more flexibility in page positioning with no need to modify host applications. Allows for field upgrades providing the latest new features from I-O. Prevents loss of host print data by providing the same level of print status reporting as a Twinax or coax printer. Permits users to print select page ranges from large documents and reports. Eliminates unnecessary overhead by converting EBCDIC data to ASCII data directly on the I-O 5730e. Permits full-function host printing on the attached LAN printer. Maximizes printer utilization by supporting concurrent printing not only from the host but from Novell, Windows, OS/2, UNIX, etc. Provides versatility in attaching to LANs at different speeds. The printers can be attached locally or remotely via a WAN or VPN network. Printers do not need to be next to the 5730e.